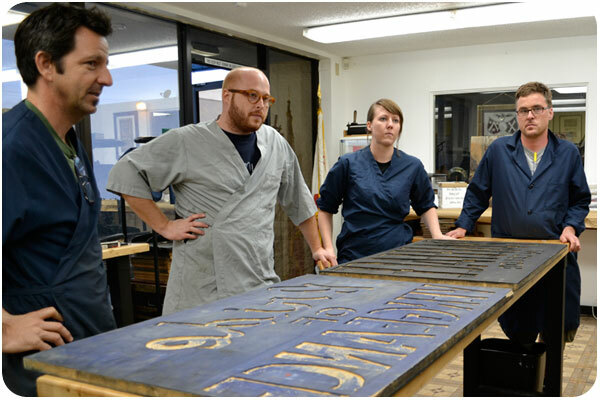 this past saturday, i got in on a trial run of a night shift workshop at the international print museum in torrance. we have one of the best-kept secrets of print archive legend right here in los angeles, but much of it just sits in drawers, waiting for use. luckily, there’s an avid group of late-night printers who have been reviving the art & trade using the invaluable resources at the museum. they recently opened their doors to a few excited designers on the kernspiracy list and i got to go! 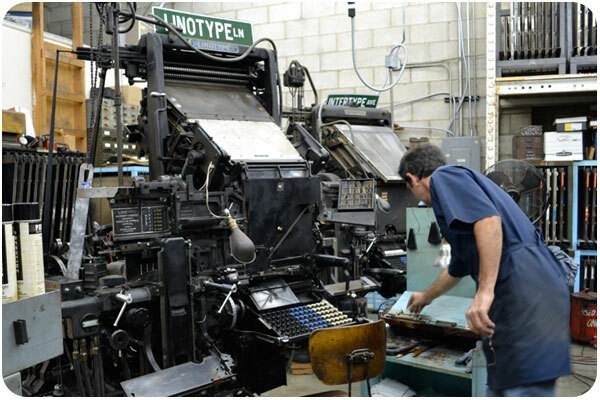 i’m probably going to get this wrong, but to say the least, the international print museum is home to many retired and donated old presses, including one of the oldest operating linotype machines. 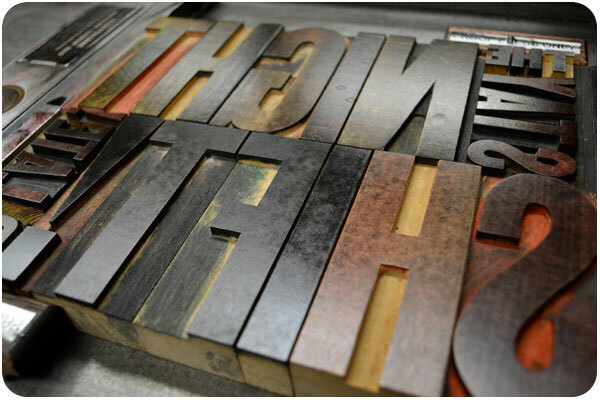 there are rooms full of equipment, including countless drawers of letterpress type, leading and kerning materials. it’s overwhelming! 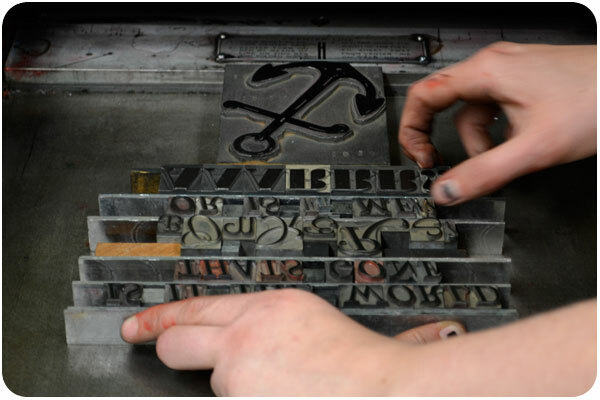 we were encouraged to play around with a central theme of getting people excited to join in on the night shift, but mostly to get a rudimentary feel for setting up a galley and going through the process of rolling out ink and pulling proofs. i looked through all kinds of cool collections of graphics and type, waffling between cool stuff and a loose concept, and ultimately i chose a type setup. once we set up our gallies, the veterans in the group helped the noobs get everything lined up, support any loose spaces with leading, center the page, roll out the ink, load paper, and crank it over the galley. 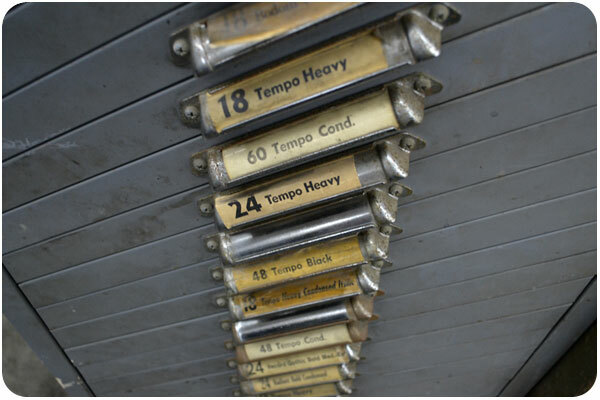 this process can take awhile, since you’re essentially testing your setup and working out kinks, but it’s also a valuable learning process. what we can do with one click now was a process of measuring, finding pieces, trying things out, and pulling proof after proof. i didn’t want to fuss too much with kerning [surprising, i know!] so mine is a little off, but it was really fun making this print. i can’t wait to go back and try out more configurations, different type styles and papers. 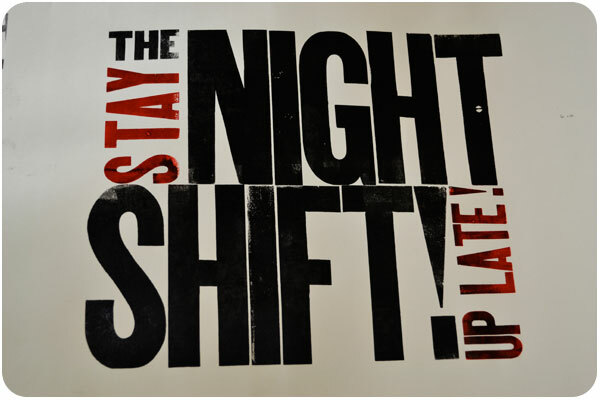 my print for the night shift - stay up late!